I stepped off of my plane into a thick wall of humid Caribbean air confronted by a familiar understanding regarding the next leg of my journey. I knew I was going to have to take another Latin American bus! In South America, it seems like on every single bus journey you’re putting your life into the hands of stock car racers who haven’t been told that it’s a bus they’re now driving. On the steep-edged, sharp mountain curves one often hears the questionable rumble of the pressure to the driver’s gas pedal, the result of which would test even an astronaut’s G-force tolerance levels. Bags on the ground and objects in the overheads are often launched across the bus in the seemingly gravity-free environment created by the twisting bus. The locals, quite used to the situation, carelessly continue reading the latest futbol news or bouncing their unseated, unbuckled kids on their laps. Speed limits, it seems, are more of a recommendation, as drivers appear to have no issue passing police officers at top speed. The bus journey, however, that I was about to embark on to Colombia’s coastal treasure Cartagena, didn’t seem to have the makings of a death road experience. The trip was only meant to take about two hours along a paved highway. I climbed onto the bus with the usual two options: to look or not to look. The option of looking seats you comfortably at the front of the bus with full views of the highway, for better or worse. This option keeps you away from the bumps of the back of the bus that haven’t truly been enjoyed by anyone older than middle school. It also keeps you away from the oft-wretched smelling toilets of the back of the bus. It seems that no one told bus designers, that if you put a toilet above the heat of an overworked engine the cooking process would not have the greatest affect. Based on a couple quick assumptions, the bus journey was short, so no one would use the toilet, and it was paved, so there wouldn’t be too many bumps, I headed to the back of the bus in order to avoid the terror of being able to watch how many near misses our driver could rack up. As the trip progressed down the winding paved highway I quickly realized that I had made the wrong decision. It seemed as though a fellow traveler was having quite the battle against a common Latin American travel foe: Montezuma’s revenge. A fight of which, according to the aromatic evidence, he was losing. Moreover, the driver seemed to have no true regard for the massive speed bumps that lay all over Latin American secondary highways. With each bump first came a hard slam on the breaks in advance of contact, sending our strained faces into the back of the seats in front of us. This was followed by the bump at the front wheels and then a heavy foot to the gas pedal. By the time the concrete lump reached the back tires we were travelling near full speed. The force of the contact would send me a couple feet into the air, and the Ipod that was resting on my lap into the ceiling. The back of the bus had all the makings of a bad rodeo, smell and feel. Certain that I never wanted to make another bus trip in my life, and wondering whether, based on this driver’s skill, I would have a choice I decided to make the switch to somewhere in the middle of the bus. After many near misses, and countless number of ongoing/outgoing passengers resting their backsides on my shoulder, I made it to my destination of Cartagena de Indias. The colonial center of Cartagena may be one of the most charming places in all of South America. It has all the vibe of New Orleans with the peace and charisma of a small Spanish village. Its narrow cobbled streets and colourful colonial buildings might leave you wondering if you’ve stepped back 400 years if it wasn’t for the yellow taxi cabs that wiz up and down the calles. This city was once known as one of the most romantic places in the World; and one look at all its vicariously hanging balconies and bright churches will leave you without a doubt as to why. The buildings of El Centro are thickly coated in full colours of blue, yellow, and pink, as they fight to hide the effects of pounding tropical rains and humid salty sea air. Their tall white pillars and oversized front doors describe a proud and inviting style. And the balconies that overlook the narrow streets leave visitors yearning for a period in time where people actually took the time to stand out on these street side box seats and watch the world as it passes us by. The canon-lined stone walls that used to protect the city from pirates and privateers now, less dramatically, shield it from the crashing Caribbean Sea waves. The barrier provides a raised walkway which is one of the best ways to truly enjoy the city and the sea. It really is one of those special places that can leave you at a standstill sucking in a deep breath as if you were hoping that you could breathe in the atmosphere and keep it with you forever. As I leave Cartagena, by bus, I look out my window and I see city of a charm, a history, and a character that is only describable to the people who have visited. Its value isn’t measurable, and its charm can not be described by words or even pictures, but by feel and feel alone. As I take my seat in the middle of the bus, the driver closes the swing arm door at the front I realize that if my next destination offers even half of what Cartagena gave, it will be worth all the bumps, bruises and anxiety of this next bus journey. Next ArticleAmantani Island – Can Tourism Enhance Culture? Great story! I’ve heard a lot about South American buses but haven’t yet experienced it. Makes for a good story, though. And I’ve heard great things about Colombia, too! I forgot how spoiled I was over the past few months living in Mexico as the buses there are more comfortable than in any other country I’ve been to. And just reading your post is enough to make me want to avoid some of those torturous overnight bus journeys that we are often forced to take during our travels, whether it be in South America, Asia, etc. But I will agree that almost always, the destination itself makes the difficult journey well worth while! I can never decide where to sit but lately I haven’t been picking the front as a way to minimize the risk of death in a head-on collision. We just left Cartagena last week. Your post made me very glad we decided to fly rather than take a bus. Very well written post – I enjoyed your descriptions and feel the same way about the old city. I have yet to experience the buses in Columbia, but your description brings back memories of the buses in Vietnam. Except that in Vietnam you don’t want to sit up front because they honk the excruciatingly loud horn every 5 seconds. I also still have nightmares of when our bus hit a lady on a motorbike. Luckily it didn’t kill her, but it was scary!! Anyway, this is a great story, which brings back memories for me of certain bus journeys. 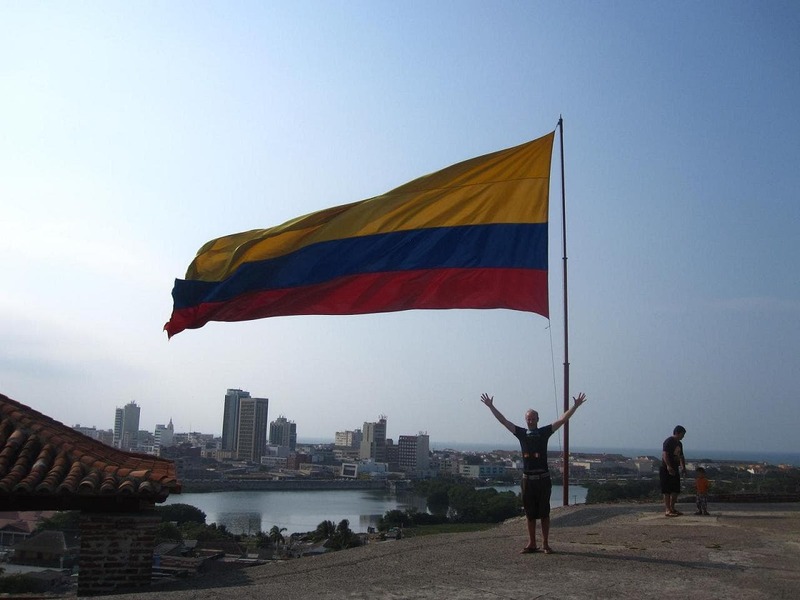 Glad you arrived safely in Cartagena and hopefully your next destination will be wonderful, too!